In the game's single-player mode, the player faces all eight characters (including a duplicate of the chosen character) in a pre-determined order, followed by a fight with the game's boss, Dural. Each fight is a best-of-three match, and the player has three ways to win: knocking out the opponent, forcing him/her out of the ring, or having more health left when time runs out. Unlike other fighting games of the early 1990s (such as Street Fighter II or Mortal Kombat), the game relies on a control stick and only three buttons, Punch, Kick, and Guard (block) although different situations and button combinations led to a vast variety of moves for each character. Akira Yuki—A kung fu teacher from Japan, fights with bajiquan. Pai Chan—Martial arts movie star from Hong Kong, fights with ensei-ken (mizongquan). Lau Chan—Pai's father and a cook from China, fights with koen-ken ("Tiger-Swallow Fist"). Wolf Hawkfield—Professional wrestler from Canada, fights with professional wrestling. Jeffry McWild—Fisherman from Australia, fights with pancratium. Kage-Maru ("Kage")—Ninja from Japan, fights with jujutsu. Sarah Bryant—College student from San Francisco, CA, fights with jeet kune do (Sega changed her fighting style to "Martial Arts" in Virtua Fighter 4: Evolution). Jacky Bryant—Sarah's older brother and a race car driver also from San Francisco, fights with jeet kune do. Dural—A gynoid that is the game's boss character and is also Kage's missing mother. She fights with a mix of all the other characters' styles. An Arab fighter named Siba was planned, and his character model even appeared on some Virtua Fighter arcade cabinets (though, in some cases, Akira's name was placed under his portrait). He was ultimately dropped, but later appeared in Fighters Megamix. Once in the Shōwa period, the defunct Japanese army intended to approach Henry Pu-yi, the last Emperor of the Ching Dynasty in their effort to take advantages. However, they were defeated by the Imperial guards who utilized the martial art called Hakkyoku-ken. During World War II, the Japanese army research the mysteries of Hakkyoku-ken to create supersoldiers, developing the ultimate martial art. Approximately half a century has passed since then, the ultimate World Fighting Tournament is about to start, and all kinds of fighters from around the world engage to determine the world's best. Behind the Tournament, however, there exists an intrigue designed by a sinister syndicate. Virtua Fighter was created using hardware jointly developed by aerospace technology firm Lockheed Martin and Sega, dubbed the Model 1. According to Sega of Japan's publicity manager, Kurokawa, "We deliberately didn't publicize all the [fighting] moves at the same time but instead revealed them to gamers one at a time by means of the Japanese videogame press." Virtua Fighter was a launch game for the Sega Saturn, and served as the pack-in launch game in North America. Its Sega 32X version was developed by the same team responsible for the Genesis port of Virtua Racing. Virtua Fighter Remix was an update of the original Virtua Fighter with higher-polygon models, texture mapping, and some gameplay changes. It was given free to all registered Saturn owners in the United States via mail. It also had an arcade release on the ST-V (an arcade platform based on the Sega Saturn) and later ported to Microsoft Windows as Virtua Fighter PC. With the 2003 PlayStation 2 release of Virtua Fighter 4: Evolution arriving in time for the series' 10th anniversary, a remake of Virtua Fighter, Virtua Fighter 10th Anniversary, was released exclusively on the PlayStation 2. While the music, stages, and low-polygon visual style were retained from the first game, the character roster, animations, mechanics, and movesets were taken from Evolution. In the previous PS2 release of Virtua Fighter 4, a button code would make the player's character look like a VF1 model. In Japan, the game was included as part of a box set with a book called Virtua Fighter 10th Anniversary: Memory of a Decade and a DVD. The box set was released in November 2003 and was published by Enterbrain. In North America, the game was included in the home version of Virtua Fighter 4: Evolution, and in Europe it was only available as a promotional item; it was not sold at retail. In an early preview of the arcade game, the October 1993 issue of Electronic Gaming Monthly hailed Virtua Fighter as a demonstration of "just how far video games have come in the last eight years." EGM made particular note of the advanced graphics, how the camera moves along different axes depending on the fighters' location, the use of multiple viewpoints in the instant replay, the high quality of the gameplay, and the smoothness and realism of the animation. It went on to become one of the highest-grossing arcade games of all time in Japan. The console port, which was nearly identical to the arcade game, sold at a nearly 1:1 ratio with the Saturn hardware during the Japanese launch. On release of the Saturn version, Sega Saturn Tsūshin scored the game a 38 out of 40. Famicom Tsūshin would score the same version a 36 out of 40 five months later. In a review of the Japanese release, GamePro praised the retention of the fighters, moves, varying camera angles, and controls of the arcade version, as well as the improved voice and sound effects and home version options, and concluded it to be "one of the best games ever bundled with a system". Their later review of the North American release was similarly laudatory, but remarked that Tekken and Battle Arena Toshinden for the soon-to-launch PlayStation were even better. Next Generation, which also reviewed the game prior to the Saturn's USA launch, disagreed, contending that "What Virtua Fighter lacks in [Battle Arena] Tohshinden's immediate graphical punch, it makes up for in grinding longevity." They particularly praised the game's depth and realism, and summarized that "The Saturn Virtua Fighter is, to all intents and purposes, the coin-op game brought home. And away from the arcade, under the harsh light of unhurried examination, its merits grow." Maximum gave it five out of five stars, calling it "a stunningly close conversion that is quite possibly the best game available for the machine." They remarked that the innovations such as the 3D motion capture remained impressive, as well as the depth and variety of the character's gameplay application: "every fighter has almost limitless scope for coming up with all-new attacks." They also praised the "very clever mixture of superbly exaggerated sound effects coupled with a tangible, realistic impact for every blow." Electronic Gaming Monthly were more subdued in their reaction, but two of their four reviewers commented that it was nearly identical to the arcade version. They scored it 31.5 out of 40 (average 7.875 out of 10). Edge rated the Saturn version 9/10, stating "Saturn Virtua Fighter has all the pulling power of the arcade version, including the swooping, gliding game camera, the stylish polygon characters, the totally convincing animation and the compulsive gameplay ... [The graphics] were impressive enough in the original, but on the Saturn, under the kind of intense scrutiny you can never give a game in the arcades, they emerge as simply astounding ... It's arguably the first true 'next generation' console game, fusing the best aspects of combat gameplay with groundbreaking animation and gorgeous sound". Sega Saturn Magazine gave Virtua Fighter Remix 5 out of 5 stars, saying that it fixed the glitches and graphics of the original game while maintaining the already excellent gameplay. Electronic Gaming Monthly scored Remix 29 out of 40 (average 7.25 out of 10). The reviewers praised all the game's improvements, but most of them concluded that it was still not worth buying for players who already owned the original game. Maximum likewise praised the quality of the game and its low price tag, but felt it was not worth buying with the release of the even better Saturn conversion of Virtua Fighter 2 less than a month away. They scored it 4 out of 5 stars. The staff of Next Generation gave it five out of five stars, applauding the graphical improvements and glitch fixes. They commented: "Perhaps never in videogame history has a problem such as Virtua Fighter been so quickly and thoroughly corrected. Virtua Fighter Remix contains all the great gameplay of the original without any of the weak spots." Scary Larry of GamePro gave the game a highly positive review for its graphical enhancements and retention of all the excellent gameplay of the original Saturn version. GamePro also ran two reader-submitted reviews for the game; King Kane argued that the graphical and audio improvements make the game worth trying even for those who are not fans of Virtua Fighter, while Tricky Ricky argued that though the game is an impressive upgrade, the lack of changes to the gameplay make its appeal quickly fade. Famicom Tsūshin scored Virtua Fighter Remix a 35 out of 40, and the Sega 32X version of the game a 30 out of 40. Next Generation reviewed the arcade version of the game, and stated that "The drawback of all Titan games, including Remix, is that the technology isn't as advanced, fast, or powerful as Model 2B [...] and these games are really like playing fast Saturn games in the arcade." Electronic Gaming Monthly scored the 32X version 30.5 out of 40 (average 7.625 out of 10), calling it an excellent conversion given the system it's on, but dated next to the graphically superior Saturn version and especially Virtua Fighter Remix, both of which had already been released. GamePro also noted that the 32X version suffers from more slowdown and fewer polygons than the Saturn version, as well as "tinny sound quality", but praised the additional options not included in the Saturn version and rated it as an overall strong port. A critic for Next Generation similarly said that the 32X version is not as impressive looking as the Saturn version but has more options and fewer glitches, making it an overall excellent port. He argued that the game was not worth buying a 32X for, since the system was not powerful enough to handle ports of Virtua Fighter Remix or Virtua Fighter 2 (which was soon to be released for the Saturn), but that it was an essential purchase for those who already own a 32X. In 1996, Computer Gaming World declared Virtua Fighter PC the 121st-best computer game ever released. Virtua Fighter dispensed with sprite-based graphics, replacing them with flat-shaded quads rendered in real-time, by the Model 1's 3D-rendering hardware, allowing for effects and technologies that were impossible in sprite-based fighters, such as characters that could move in three dimensions, and a dynamic camera that could zoom, pan, and swoop dramatically around the arena. It has been credited with both introducing and popularizing the use of polygon-based graphics in fighting games. 1UP listed it as one of the 50 most important games of all time. 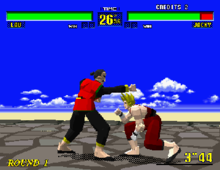 They credited Virtua Fighter for creating the 3D fighting game genre, and more generally, demonstrating the potential of 3D polygon human characters (as the first to implement them in a useful way), showing the potential of realistic gameplay (introducing a character physics system and realistic character animations), and introducing fighting game concepts such as the ring-out and the block button. At a time when fighting games were becoming increasingly focused on violence and shock value, the popularity of Virtua Fighter demonstrated that fighting games focused on gameplay were still commercially viable. Game designer Yasuyuki Oda remarks being impressed by this video game while working for SNK. Virtua Fighter played a crucial role in popularizing 3D polygonal graphics. In particular, Virtua Fighter garnered praise for its simple three-button control scheme, with the game's strategy coming from the intuitively observed differences between characters that felt and acted differently rather than the more ornate combos of two-dimensional competitors. Virtua Fighter's fluid animation and relatively realistic depiction of distinct fighting styles gave its combatants a lifelike presence considered impossible to replicate with sprites. Some of the Sony Computer Entertainment (SCE) staff involved in the creation of the original PlayStation video game console credit Virtua Fighter as inspiration for the PlayStation's 3D graphics hardware. According to SCE's former producer Ryoji Akagawa and chairman Shigeo Maruyama, the PlayStation was originally being considered as a 2D focused hardware, and it was not until the success of Virtua Fighter in the arcades that they decided to design the PlayStation as a 3D focused hardware. Toby Gard also cited Virtua Fighter as an influence on the use of polygon characters—and the creation of Lara Croft—in Tomb Raider: "It became clear to me watching people play Virtua Fighter, which was kind of the first big 3D-character console game, that even though there were only two female characters in the lineup, in almost every game I saw being played, someone was picking one of the two females." John Romero also cited Virtua Fighter as a major influence on the creation of 3D first-person shooter Quake. Team Ico's Fumito Ueda also cited Virtua Fighter as an influence on his animation work. ^ "Megadrive Review: Virtua Racing". Mean Machines (19): 48–50. Retrieved 24 July 2015. ^ "Preview: Die Hard Arcade". Sega Saturn Magazine. No. 16. Emap International Limited. February 1997. p. 24. ^ a b c "Virtua Fighter Remix". Next Generation. No. 12. Imagine Media. December 1995. p. 209. ^ "Sega-16 – History of: Virtua Fighter". ^ "AM2". Next Generation. Imagine Media (4): 68–69. April 1995. ^ "Sega's Saturn Launched in Japan". Electronic Gaming Monthly. Ziff Davis (65): 60. December 1994. ^ "Virtua Short Stories". Maximum: The Video Game Magazine. Emap International Limited (1): 117. October 1995. ^ Kalinske, Tom (October 1995). "Saturn Savaged on the Net: Tom Kalinske Strikes Back". Maximum: The Video Game Magazine. Emap International Limited (1): 115. ^ "NG Alphas: Sega Entertainment". Next Generation. No. 22. Imagine Media. October 1996. p. 103. One of the first titles to appear is Virtua Fighter PC, which has more in common with VF Remix than the original. ^ "Virtua Fighter 10th Anniversary Hits Japan". IGN. Ziff Davis. 10 October 2003. Retrieved 19 May 2013. ^ Williamson, Colin (2014-11-14). "Virtua Fighter - Overview - allgame". Web.archive.org. Archived from the original on November 14, 2014. Retrieved 2016-03-11. ^ "Computer and Video Games - Issue 168 (1995-11)(EMAP Images)(GB)". Archive.org. Retrieved 2016-03-11. ^ a b Edge Staff (1994-12-22). "Virtua Fighter Review". Edge Online. Retrieved 2014-01-22. ^ a b "Review Crew: Virtua Fighter". Electronic Gaming Monthly. Ziff Davis (72): 38. July 1995. ^ a b "Virtua Fighter Remix Review". Electronic Gaming Monthly. Ziff Davis (76): 46. November 1995. ^ a b おオススメ!! ソフト カタログ!! : バーチャファイター. Weekly Famicom Tsūshin. No.335. Pg.114. 12–19 May 1995. ^ a b NEW GAMES CROSS REVIEW: バーチャファイター. Weekly Famicom Tsūshin. No.358. Pg.30. 27 October 1995. ^ a b "Virtua Fighter". Maximum: The Video Game Magazine. Emap International Limited (1): 142–3. October 1995. ^ a b "Reassuring". Next Generation. Imagine Media (10): 113. October 1995. ^ a b "Virtua Fighter". Next Generation. Imagine Media (4): 88. April 1995. ^ a b "Un-X-Pected!". Next Generation. Imagine Media (11): 177. November 1995. ^ a b "Review: Virtua Fighter Remix + CG Portrait Collection". Sega Saturn Magazine. Emap International Limited (1): 94. November 1995. ^ a b SegaSaturn GameCross Review: バーチャファイター. Sega Saturn Tsūshin. No.1. Pg.6. 2 December 1994. ^ Edge Staff (March 3, 2006). "Japan Votes on All Time Top 100". Edge / Famitsu. Archived from the original on 2008-07-23. Retrieved November 24, 2008. ^ a b Staff (November 1996). "150 Best (and 50 Worst) Games of All Time". Computer Gaming World (148): 63–65, 68, 72, 74, 76, 78, 80, 84, 88, 90, 94, 98. ^ "GameSpot Presents: Readers' Choice: 15 Most Influential Video Games of All Time". Web.archive.org. Archived from the original on November 20, 2001. Retrieved 2016-03-11. ^ a b "Classic 1UP.com's Essential 50". 1UP.com. Retrieved 24 July 2015. ^ "Virtua Fighters". Electronic Gaming Monthly. Ziff Davis (51): 66. October 1993. ^ "Ultimate Future Games - Issue 02 (1995-01)(Future Publishing)(GB)". Archive.org. Retrieved 2016-03-11. ^ "Saturn ProReview: Virtua Fighter". GamePro. IDG (68): 31. March 1995. ^ "ProReview: Virtua Fighter". GamePro. IDG (83): 48. August 1995. ^ "Maximum Reviews: Virtua Fighter Remix". Maximum: The Video Game Magazine. Emap International Limited (2): 143. November 1995. ^ "ProReview: Virtua Fighter Remix". GamePro. IDG (87): 72–73. December 1995. ^ NEW GAMES CROSS REVIEW: バーチャファイター リミックス. Weekly Famicom Tsūshin. No.344. Pg.31. 21 July 1995. ^ "Virtua Fighter Review". Electronic Gaming Monthly. Ziff Davis (75): 36. October 1995. ^ "ProReview: Virtua Fighter". GamePro. IDG (86): 66. November 1995. ^ a b "Virtua Racing – Arcade (1992)". 15 Most Influential Games of All Time. GameSpot. 2001. Archived from the original on 2010-04-12. Retrieved 19 January 2014. ^ a b "Future Fights: A Looking Glass into Tomorrow's Fighting Games". Electronic Gaming Monthly. Ziff Davis (68): 91–93. March 1995. ^ "Tekken 2". Maximum: The Video Game Magazine. Emap International Limited (1): 21. October 1995. At the end of 1993, the genre was re-defined by Sega's Virtua Fighter, which introduced stunningly animated 3D polygon fighters that greatly excited arcade gamers. ^ "『ザ・キング・オブ・ファイターズ XIV』プロデューサーインタビュー！ 最新作は新旧スタッフが総力を挙げて開発(1/2)". Famtisu. Retrieved December 11, 2015. ^ Leone, Matt (2010). "The Essential 50 Part 35: Virtua Fighter". 1UP.com. Archived from the original on July 19, 2012. Retrieved December 10, 2016. ^ Kent, Steven L. (2001). The Ultimate History of Video Games: The Story Behind the Craze that Touched our Lives and Changed the World. Roseville, California: Prima Publishing. pp. 501–502. ISBN 0-7615-3643-4. ^ "Virtua Fighter Review". Edge. December 22, 1994. Archived from the original on December 10, 2014. Retrieved March 5, 2015. Virtua Fighter's 3D characters have a presence that 2D sprites just can't match. The characters really do seem 'alive', whether they're throwing a punch, unleashing a special move or reeling from a blow ... The Saturn version of Virtua Fighter is an exceptional game in many respects. It's arguably the first true 'next generation' console game, fusing the best aspects of combat gameplay with groundbreaking animation and gorgeous sound (CD music and clear samples). In the arcades, Virtua Fighter made people stop and look. On the Saturn, it will make many people stop, look at their bank balance and then fork out for Sega's new machine. Over to you, Sony. ^ Feit, Daniel (2012-09-05). "How Virtua Fighter Saved PlayStation's Bacon". Wired. Retrieved 2014-10-09. Ryoji Akagawa: If it wasn't for Virtua Fighter, the PlayStation probably would have had a completely different hardware concept. ^ Thomason, Steve (July 2006). "The Man Behind the Legend". Nintendo Power. 19 (205): 72. cf. Gard, Toby (June 28, 2001). "Q&A: The man who made Lara". BBC News Online (Interview). BBC. Archived from the original on December 15, 2002. Retrieved July 12, 2016. ^ Edge (45), May 1997, My original idea was to do something like Virtua Fighter in a 3D world, with full-contact fighting, but you'd also be able to run through a world, and do the same stuff you do in Quake, only when you got into these melees, the camera would pull out into a third-person perspective. It would’ve been great, but nobody else had faith in trying it. The project was taking too long, and everybody just wanted to fall back on the safe thing – the formula.